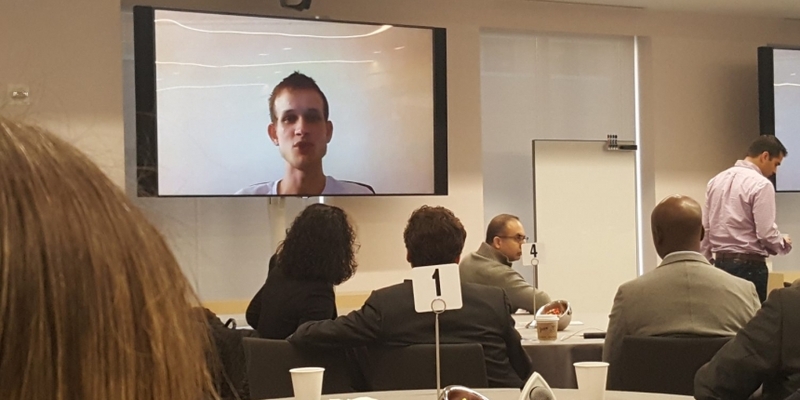 In a televised speech at the launch of the Enterprise Ethereum Alliance today, ethereum’s creator, Vitalik Buterin, focused on why enterprise blockchains, generally seen as competitors to public networks, might have an interest in working together. Announced today, the Enterprise Ethereum Alliance is a new group of major companies that plans to develop blockchain applications on ethereum (think Microsoft and JPMorgan). Long-rumored, the event today served as a coming out party for the incumbents and startups involved. In the video, Buterin outlined a technical ethereum roadmap and ended with a summary of the synergies between private and public versions of ethereum. Notably, Buterin never mentioned the Enterprise Ethereum Alliance by name, but spoke generally to the differences between public and enterprise implementations, as well as the challenges that both types of networks will need to confront. Buterin is also a representative of the Ethereum Foundation, the Swiss non-profit organization founded to support the public ethereum network. However, Buterin has long shown a willingness to cross the aisle and work with corporates. The Enterprise Ethereum Alliance is the latest consortium focused on blockchain technology to emerge, adding to a group that includes the Hyperledger project and banking consortium R3CEV, the latter of which has collaborated with Buterin on reports for its member institutions. One example Buterin listed as an area of mutual concern for both groups is the optimization of the ethereum virtual machine (EVM), the key innovation that makes it possible for ethereum to deploy more complicated smart contracts. Both private and public versions will need to use it, and Buterin believes that, perhaps, the two communities can pair up to solve issues confronting its more widespread implementation and use. The comments are noteworthy as some in the ethereum community seem to view the Ethereum Enterprise Alliance as a Trojan Horse for the public version of ethereum, rather than as an end in itself. Some developers in the ethereum community are also wary of private versions due to how they permission access to these systems. While the public ethereum blockchain is open for anyone to join and participate in, for example, a private version may be controlled by a vetted group of participants. Still, Buterin did his best to quiet such thinking, striving to extend the olive branch as the groups look to move ahead on development.